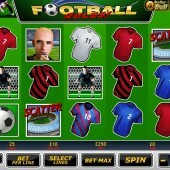 You are trying to pick a football-themed slot to spend a few hours of your valuable time in front of. There are many choices, some bad, some good, when online slot developer Playtech’s Football Rules slot wanders into the box. What do you do? Fans of the classic You Are The Ref newspaper column will find much to like in this slot, as it centres on the man everyone loves to hate – Sir Alex Ferguson. Just kidding, it’s the referee. 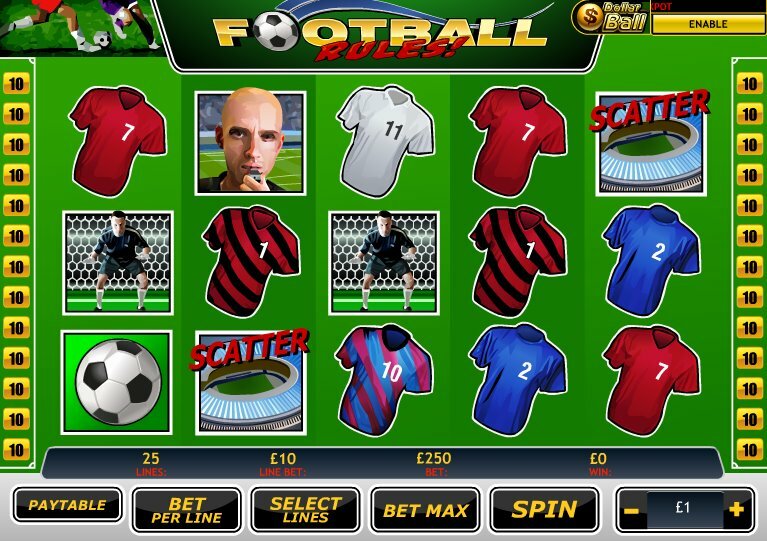 With its football-pitch greens and Roy of the Rovers-style graphics, you know where you are straight away in this 5-reel, 25-payline slot. All that’s needed are some whistles and other football-themed sound FX. They’re here too, you say? All good. It’s not all about the man in black, however, with the goalkeeper, the No. 10, 1, 11, 2 and 7 jerseys, stadium, plus the football itself filling out the reels. However, as everyone knows, the real hero in football is the fan, and here the wildly celebrating fan acts the, er, Wild. He substitutes for every symbol other than the scatter. The scatter is the goatee'd goalie. Three or more of these will pay out your total bet with a generous multiplier which can be 5, 10 or 50 respectively. So far, so mid-table mediocrity. So who’s going to score the last-minute 30 yard volley in this game? Well, that honour falls to the World Cup winner symbol. When one of these guys appears simultaneously on reels 1 and 5 you’ll be whisked off in front of a goal filled with balls. Choose the balls; reveal the number of free spins. Easy. Then choose which side of the goal you want to fire your ball into. Depending on where you opt for, you’ll reveal a multiplier that will apply to any winnings gained during the free spins. If you’re a Roberto Carlos you could be looking at 20 free spins with a 10x multiplier. If you’re more of a non-league no-hoper you’re probably looking at something slightly less. If one jackpot element isn’t enough for you, however, the Dollar Ball side game, similar to lotto, is your key for unlocking the progressive jackpot. Exclusive to Playtech, the game can be played at any time, and requires you to pick five numbers from 1-49. When you go back to the main game, five numbers will be drawn randomly. The more numbers you match, the more you win - simples. If all five numbers match, you’ll take down the progressive jackpot. The graphics may be pretty functional and the sound effects basic, but anyone growing up with football comics, and footie fans in general, will love this slot. If you want a bit more penalty-box drama to your slots, head over to Playtech’s football themed Top Trumps Football Stars slot, which offers a little more glamour, or the same developer's Football Carnival. In the meantime, this slot’s name won’t be going into the ref’s book any time soon.